When someone is suffering from restless leg syndrome, it is highly likely that they will have trouble sleeping or relaxing. RLS is an affliction which causes a sensation in the legs that feels like itching. This “prickly” feeling in the legs is at times quite painful. Restless leg syndrome takes place while sleeping and disturbs a person’s normal sleep patterns. Over-the-counter cold medications, blood pressure medicine and drugs used to treat asthma can lead to insomnia. Other medicines like anti-depressants and certain diet pills can also interrupt normal sleep patterns and get in the way of a good night’s rest. Common chemicals that affect both quantity and quality of sleep include alcohol, caffeine, nicotine, and antihistamines, as well as prescription medications like beta blockers, alpha blockers, and antidepressants. Research shows that the neurological disorder of sleep regulation known as narcolepsy can affect a person’s ability to control napping and wakefulness. It is important to see a doctor to see whether or not narcolepsy is the reason for the sleep disorder. People over age sixty-five are the most prone to having sleeping problems. It is thought that the body needs less sleep as we get older, and also older people tend to take more medications which may affect healthy sleeping patterns. Pressure in the workplace, marital or family problems and other types of emotional stress all contribute to sleep disorder symptoms. Problems that you have in your waking hours are often taken to bed, leading to a sleepless night. Such emotional stress is hard to let go of, so that even in your resting time your mind will dwell on it. Going to bed with a calm mind makes it much more likely that you will get a good night’s sleep, so learning relaxation techniques and biofeedback can be very helpful. Alcohol and tobacco are the two most common factors that make your body more likely to contract a disease or have other health problems. Overindulging in alcohol can make it difficult to fall asleep or stay asleep, while smoking can lead to breathing problems. The amount of light present is one of the most important external factors that affects sleep. By making it difficult for people to fall asleep, light has a direct effect on the quality of sleep. Light also affects the timing of the body’s internal clock, which is how the body knows it’s time to go to sleep. Individuals with mental disorders like anxiety or depression may also exhibit symptoms of a sleep disorder. Depression and anxiety result from feeling helpless to solve one’s problems. Sleep patterns are often disturbed as a result of this constant worry and emotional burden. People who experience stress, anxiety, and depression often have more difficulty in falling asleep. Furthermore, their sleep tends to be light and includes more REM sleep and less deep sleep. This happens because the human body is programmed to respond to stressful and potentially dangerous situations by arousing the brain. Stress stimulates this natural brain arousal response, thus making restful sleep more difficult to come by. Someone who works nights, known as the “graveyard shift,” obviously has a different sleep schedule than most. Having spent most of his or her life sleeping at night, it is often a difficult adjustment to sleeping during the day. A sleep disorder often results due the body’s inability to adjust to becoming a day sleeper. Business people who travel across time zones or work the night shift often experience two sleep disorder symptoms. The first is insomnia when they are fighting against their body clock as they try to sleep. The second symptom is sleepiness during the time their body clock is telling them that they should be asleep. 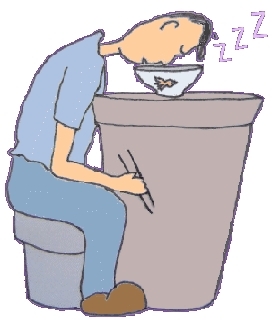 As a matter of fact, 50% of all night shift workers regularly report falling asleep at work! The aforementioned conditions are the primary reasons why people may develop a sleep disorder, and it is important to address them based on each person’s unique circumstances. More serious sleep disorders like sleep apnea syndrome may require medical intervention, but most cases of insomnia can be cured if the root causes are understood.